This week's Beer of the Week comes from Rodenbach Brewery located in that most favorite of ale countries of the world, Belgium. According to BeerTourism.com, Rodenbach Brewery has been around since 1836 and was founded by Pedro Rodenbach and his wife, Regina Wauters, who just happened to be the daughter of a a rich brewer. In 1864, their son, Edward, took over the brewery and expanded it. The Rodenbachs again kept the brewery in the family when Edward's son, Eugene, took it over in 1878. Eugene brought in the huge oak foeders, giant wooden barrels, to age the beer in. Some of those original foeders are still used to day while most others have been replaced. When Eugene died in 1889, the brewery was run by his daughters and granddaughters for a hundred years until it was finally sold to Palm Belgium Craft Brewers. 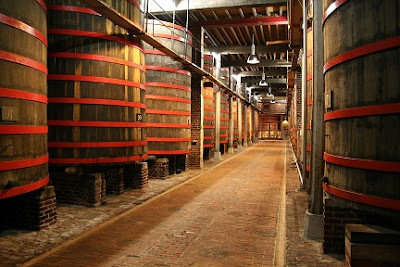 The Rodenbach Vintage 2014 sour ale undergoes two fermentation stages and is aged in the oak foeders for two years. Before being bottled, one quarter of the mature sour ale is blended with three quarters of younger ale to smooth out the sourness. So, how is the sour ale? The first thing that is noticeable is that the beer is not capped but corked. It's a nice looking 750 ml bottle with a faded picture of brewery, glass in hand, standing in front of a foeder. The sourness is noticeable right away in the aroma and is quite pronounced. It pours with a reddish hue to it and an off white head. On my first sip, my mouth explodes with a wonderful sour kick and I notice a slight tingle on my lips. During my next sips, I notice that that sourness has leveled off and is replaced somewhat with an oakiness. This ale is full of flavour. Because of this, it will be very hard to drink in one sitting. I'll have to save half for tomorrow. I would buy this again but only if I had someone to split it with. Teena does not like sours and will definitely scrunch her nose up at this one.